Vince Doria now is a BlackBerry man. The sports world vibrates in his pants pocket every few seconds. Talk to him for 15 minutes and he will take out his latest little gadget, contraption, whatever it is, at least three or four times and click his fingers across the miniature keyboard to answer queries, realign troops, check out the running score of, say, the Mets and the Cardinals in St. Louis. He always has lived next door to the latest athletic crisis and now he can carry it with him wherever he goes. Trade rumors in Seattle? Positive drug tests for Olympic champions in Brussels! A request from a reporter for a day off in Denver! Progress is wonderful. "How did we get along without this?" asks the 2009 winner of the Red Smith Award for major contributions to sports journalism, announced Wednesday by the Associated Press Sports Editors. "I can push a button and send a message to 20 different people at the same time. You used to have to call ’em all, track ’em down." At the back end of his fourth decade in the sports writing business, Doria has made the necessary cartwheels into the future. While newspapers cough, sputter and sometimes die, while debate swirls around the blogosphere about who is going to pay whom to gather facts, quotes, anecdotes, he is the Senior Vice President and Director of News for all of ESPN’s platforms in video, audio, print and on-line content, busier than he ever has been. He makes sure all of the stories are covered, all of the calls are made. He separates the good from the bad, bypasses the indifferent. He runs his department, does the same things he has done for an adult lifetime, makes sure his people not only are on the ball, but can explain why it squirted through Bill Buckner’s legs. Only now he does it at warp speed. "Vince is a legend in this business and deserves all the accolades he receives," APSE President Lynn Hoppes said in announcing the Red Smith award. "He, along with some of the greats of years gone by revolutionized this business and Vince still is setting the agenda for how we should be practicing journalism." A graduate of Ohio State, Doria started in the sports writing business when newspapers were noisy places, when typewriters clicked and wire machines clacked, when bells rang, when stories were set in hot lead and when the news was delivered with a thump on most people’s front doors. His first job was at the Asthtabula (Ohio) Citizen-Journal in 1971, where he started out wanting to BE Red Smith, rather than win any Red Smith award. "It’s funny how things go," he says. "I think everyone got into this business at the start because he wanted to write, to cover the games. We had one of those little three-man sports departments in Ashtabula where everyone did everything. Everyone wrote. Everyone did lay-out, copy-editing, the works. It just turned out that the first job offer I got was to work on the desk in Philadelphia doing the other things, rather than writing. I never planned my career. That’s just the job that I got." The job was at the Philadelphia Inquirer in 1973, where he drew attention for his layouts and his management skills. This sent him to the Boston Globe in 1975, where he quickly moved from assistant sports editor to sports editor of a section generally acknowledged as the best in the country at the time. His style was perfect for a staff that featured baseball writers Peter Gammons and Larry Whiteside, who both eventually would be inducted into the media wing of the Baseball Hall of Fame, Bob Ryan, Basketball Hall of Fame, Leslie Visser, Pro Football Hall of Fame, Kevin Paul Dupont and Fran Rosa, Hockey Hall of Fame, Bud Collins, Tennis Hall of Fame and Collins, Will McDonough and myself, National Sportscasters and Sportswriters Hall of Fame. He was Joe Torre, not Bobby Knight, a players’ manager, a boss who let people do their jobs, who could massage outsized egos, who had an ear and appreciation for good writing and a wonderful sense of what was news and what wasn’t. In 1989 he left the Globe to become an assistant managing editor at The National, a start-up national sports daily tabloid that struggled for 18 months then died a quiet death due to circulation and advertising problems. In 1992, he joined ESPN as an editor, gradually rising to his present position. "I basically do the same things I did at the Globe," Doria says. "It’s just a lot more people." He is still the newspaperman, simply not working at a newspaper. At the Globe one day in the long ago he sat behind a pile of resumes from college applicants for summer intern positions, maybe 300 folders filled with clips of stories written for college dailies. He lamented the lack of facts in the stories, the rush to easy opinion rather than research. Funny, he still laments, his pile grown even larger in the blog opinion culture. "Everyone sees PTI, everyone wants to be the next Tony Kornheiser and Michael Wilbon," Vince Doria says. "Well, Kornheiser and Wilbon are very good, but they know what they’re talking about. They’ve been around. They’ve done the work. Their opinions are based on something." Red Smith couldn’t have said it any better. 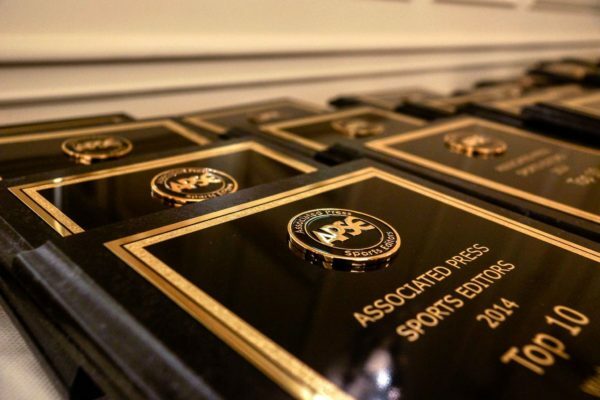 Doria will receive the award named after the legendary New York Times columnist at a luncheon at the APSE Convention in Pittsburgh on June 26.